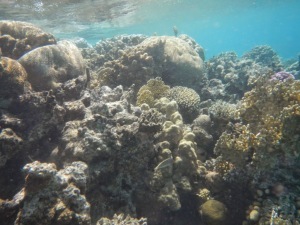 So when we were making plans to visit the Red Sea, it seemed inconceivable to miss out on some quality boat time. 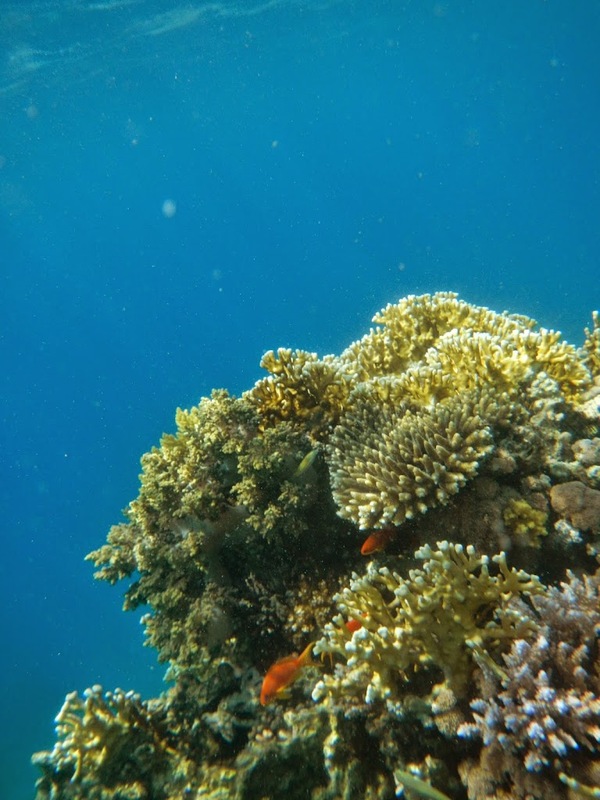 Apart from the fact I wanted to see all the best coral, there’s nothing better than skimming over the waves into the horizon. 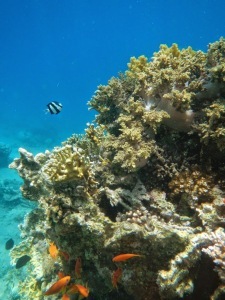 There were a couple of dive companies in Tala Bay who ran boat trips out to the reefs, but the nearby city of Aqaba would be the best bet for a good deal. Unfortunately I hadn’t got the time or funds to get my PADI licence this time around, but most dive boats would take snorkellers too, as well as providing equipment. However, there were two considerations. Firstly, I was the only one in my party who was keen for such a trip. If I wanted to go, I would have to go solo. Not a problem in itself, but it would complicate transport arrangements. Secondly, these trips get booked up well in advance. I’d tried making some calls earlier in the week, but had failed to arrange anything successfully by Thursday. I would have to make a lot of phone calls to find someone willing to take me for a reasonable price at such short notice. 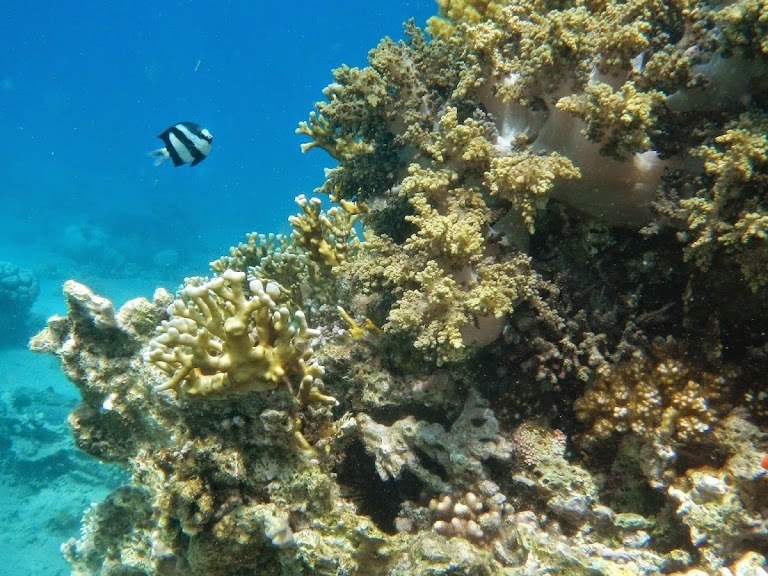 I’m pretty persistent when I’ve set my heart on doing something, so I woke up early on Friday morning and proceeded to ring every single dive company in Tala Bay and Aqaba. (Good thing my phone bill is covered by my company.) Unfortunately, many were booked up, or simply too expensive. 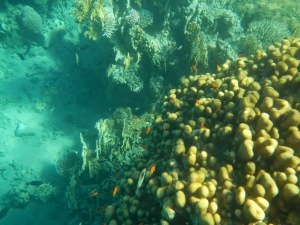 I eventually found a company called Dive Aqaba, who would take me on a full day trip for 35JD with lunch included. However, I would have to be in Aqaba within 20 minutes of making the call. 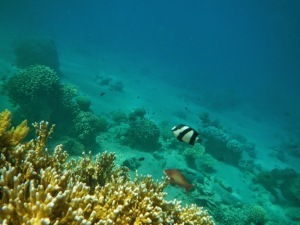 It takes 20 minutes to drive to Aqaba from Tala Bay. 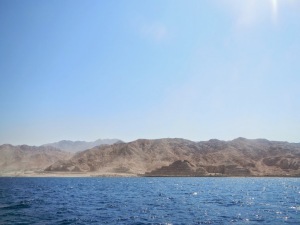 After some rather frantic driving arrangements, I was on my way into Aqaba. 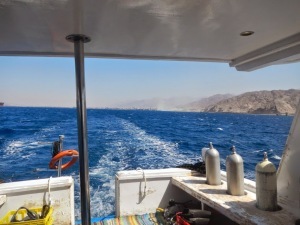 I arrived slightly late at the dive company HQ, but that was fine – since 1) ‘Jordanian time’ means that being late is on time and being on time is early, and 2) all the divers I know seem to be very chilled out, easygoing people. We made our way down to where the boat was moored, and I got a first look at my boatie companions for the day. There were a couple of families who were there for the ride, but the boat was predominantly divers, including some who were getting their Open Water certification. I was the only serious snorkeller. 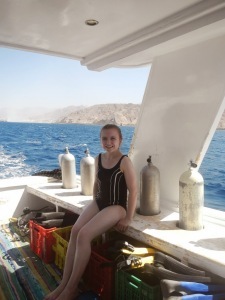 Anyway, as I was getting into my swimsuit for the first dive spot, I realised the big negative of my solo status – I had no-one to put suncream on my back. I did have a T-shirt I could wear in a worst-case scenario, but if I wanted to keep it dry for later, I would have to ask one of my new friends to do the honours. I went up to a friendly-looking woman in her twenties, and, in one of the most amusing/embarrassing experiences of the last few weeks, noted that yes, it was a really weird request, and she was totally within her rights to say no, but was there any chance she might possibly consider helping me with my suncream? She found it hilarious, and, being an absolute Good Samaritan, did indeed help me with my suncream application. Thank you to kind strangers everywhere. 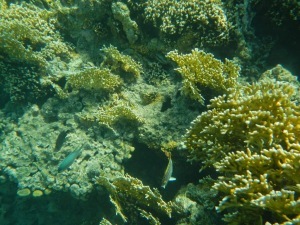 You’re probably wondering if I actually ever did get to see the Red Sea marine life, given all the preceding kafuffle. 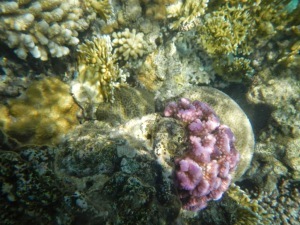 We stopped at two sites, and I finally got to whip out my snazzy underwater camera, hired specially for the occasion. 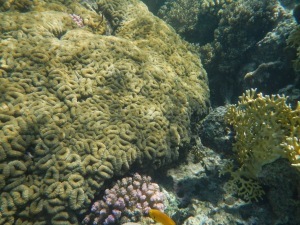 I’ll be honest, the first site, Cazar Reef, was a tad disappointing – not because of a lack of sea life or coral, but because the visibility was so poor at the time. 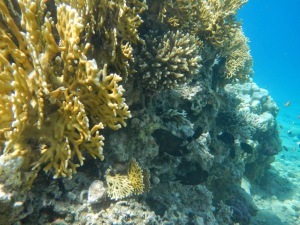 Also, it took me a while to figure out that underwater photography requires some very different techniques to normal everyday photography. 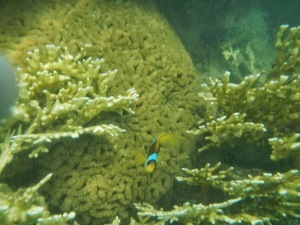 However, the second site, called the Power Station, was INSANE – beautiful pink and white coral, crazy-shaped brain coral, and every colour of fish you can imagine, with great visibility to boot. This site made the boat trip totally worthwhile for me. 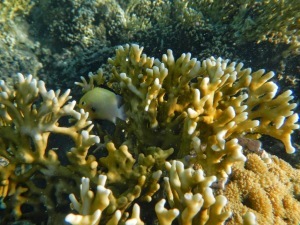 By this stage I was starting to get to grips with the whole underwater photography thing. Here are some of my favourite pictures from the day. 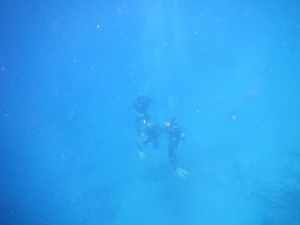 There was a huge dropoff at the Power Station, which the divers loved. I quite like this picture where you can see them deep below. 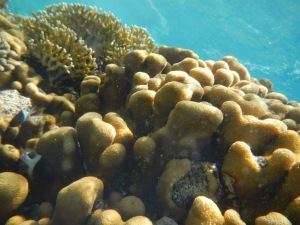 As a snorkeller, I felt like a ‘Top Dweller’ looking down into ‘Bism.’ (If you don’t get the reference, we clearly didn’t read the same books in childhood.) Totally, totally jealous of the divers! Eventually it was time to head back to the shore, after a lunch of rice, chicken, and unlimited coffee and Coke. So far, no sunburn apparent. 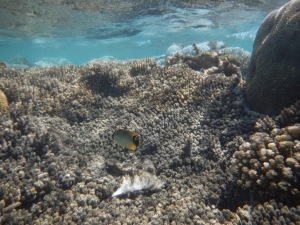 This was not the last of my Red Sea adventures though – more coming up in the next post.